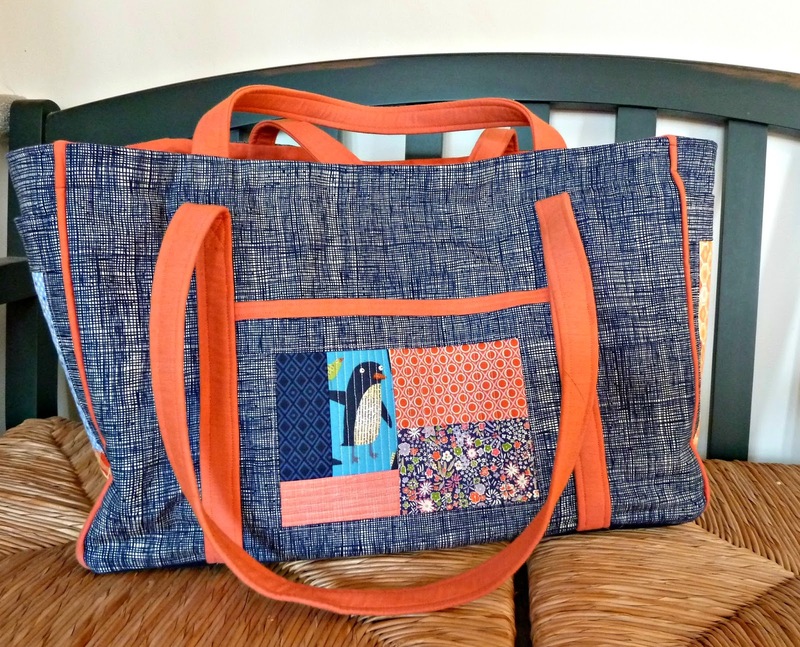 Don't get me wrong, I LOVE my new Sewing Circle Tote... now that it's done! If you've been following my progress on Facebook and Instagram you know I skipped around a bit on the directions, mostly because I didn't have all of my fabrics picked out in advance. Steps 13 - 34 I started by making the Patchwork Pockets which is definitely the highlight of the project. 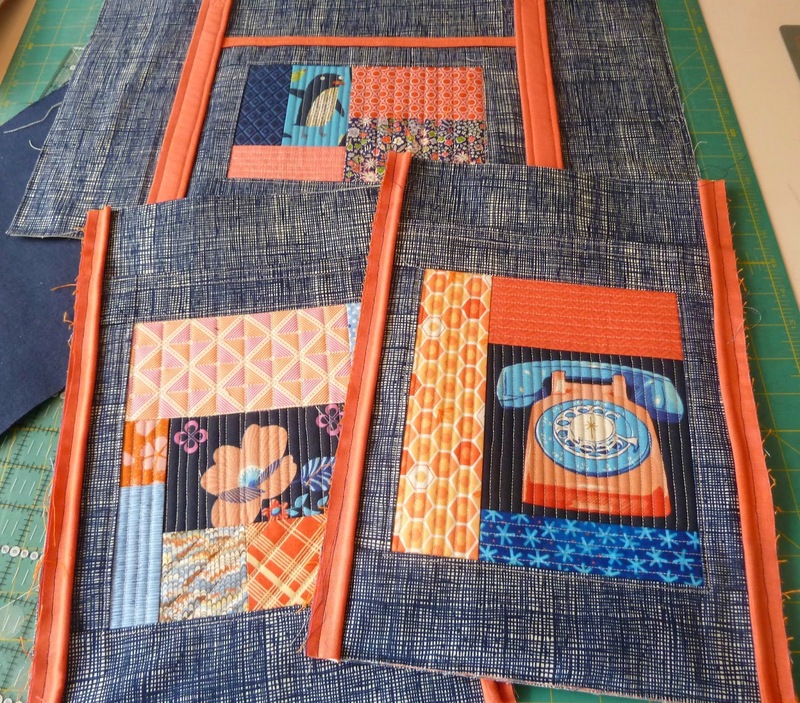 I used the Melody Miller telephones as my inspiration and pulled scraps from my stash from there. I was on a roll and just kept going... oops, need those straps now. Go back to Step 1. Steps 1 - 8 Making the straps isn't hard but if I did it again I'd cut my fabric at 4 1/2" to give the cotton webbing a little more breathing room. Advance to Step 35 and realize the directions said make 2 straps 60" long, NOT make a strap 60" long and cut it in 2. 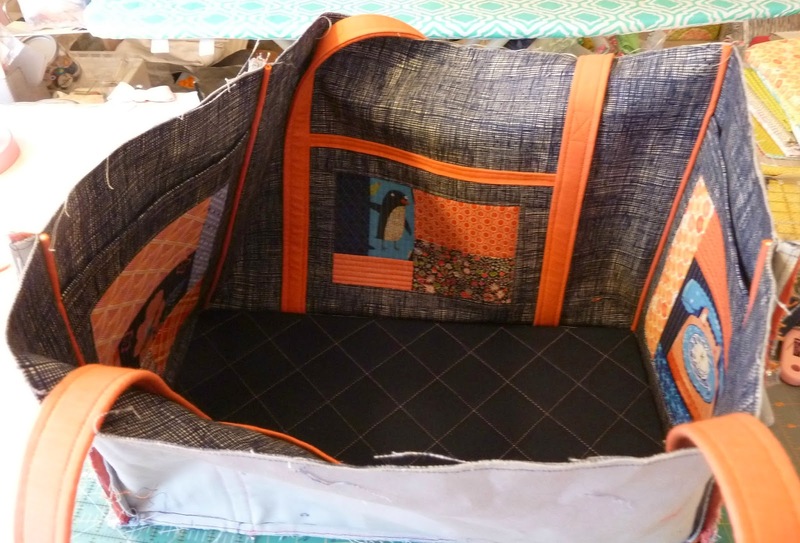 Make a trip to Quilter's Way for more fabric and repeat Steps 1 - 8. 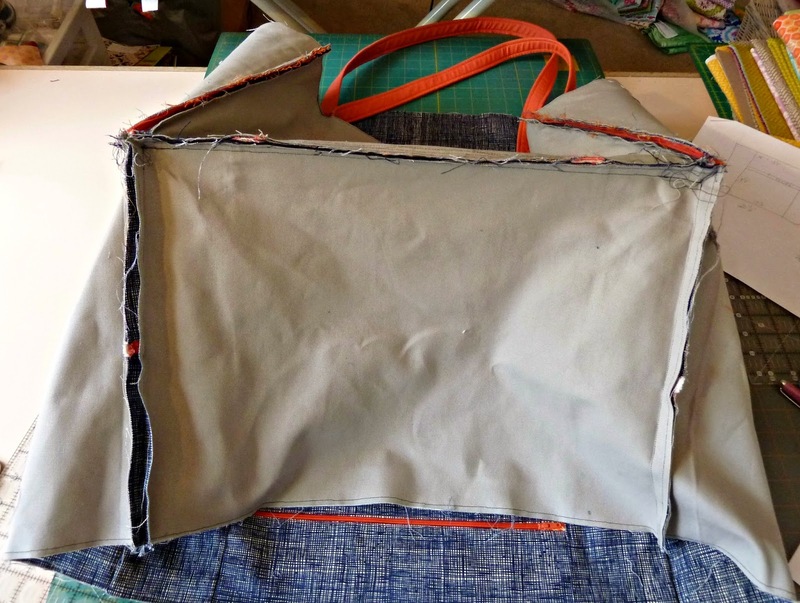 Steps 35 - 41 Decide to add piping to the side panels ala the Amy Butler Weekender bag. Bag is coming together and now needs the bottom I skipped making. Steps 9 - 12 My bag just made it to 2nd base. 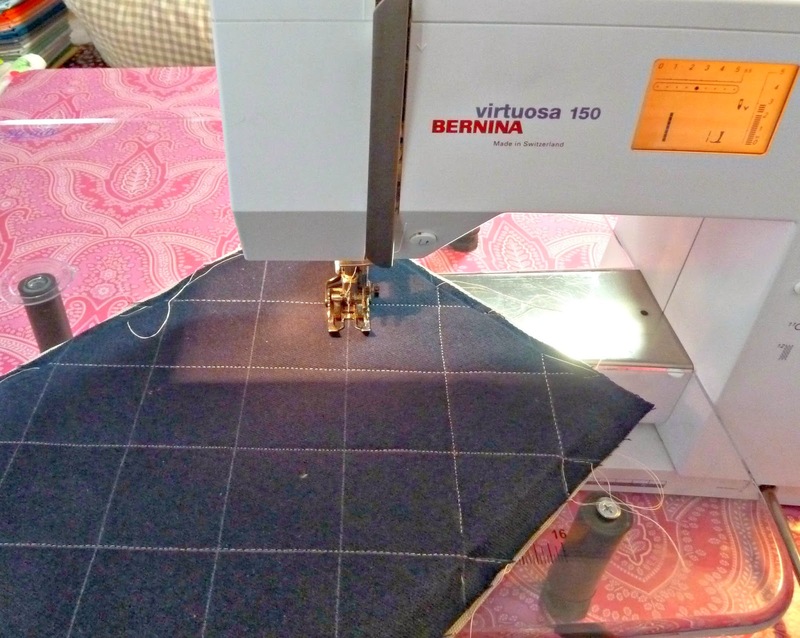 Quilting through Peltex is insane and it's really hard to move this under the machine. Either my arms are too short or I have to sit next to my machine to get everything through. Steps 42 - 45 Attaching the bottom to the bag is even worse than quilting it. There is much cursing going on but it's finally done. Steps 46 - 67 I'm losing my ability to follow a pattern, all those zip pockets are unnecessary. I'm only making the big one. Steps 68 - 76 The gathered pockets look cool but I'm only doing the big one and the two sides. I decide I'd rather have a slip pocket on the other side for folders. 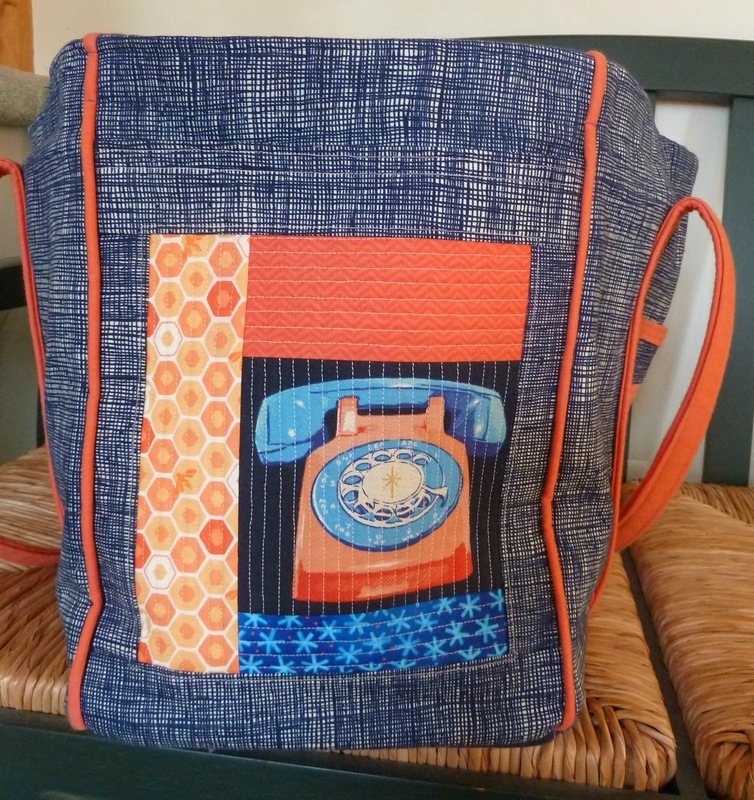 Go off pattern using Elizabeth's technique from the Perfect Quilted Tote. Realize this requires math. More cursing but the interior pockets are finally done. Step 82 Sew through my thumb while using the zipper foot to attach the interior and exterior bottoms. Cursing, tears, and a delay while I remove the bloodstains from the handles. A smart person would have stopped here. Steps 83 - 87 Easy peasy, just keep your bloody thumb away from the straps. Steps 88 - 89 The second hardest part of making this bag! Sewing the facing through all those layers while trying to maneuver the bag was insane. Run out of thread and have to wait until morning for another trip to Quilter's Way. Using contrasting thread was probably a mistake. Rework the bottom. I'd leave the exterior bottom as plain fabric/duck. Quilt the interior bottom with batting and duck. Add the 3 layers of Peltex as a slip in between the layers or make a false bottom. There shouldn't be a lot of stress on the top facing. 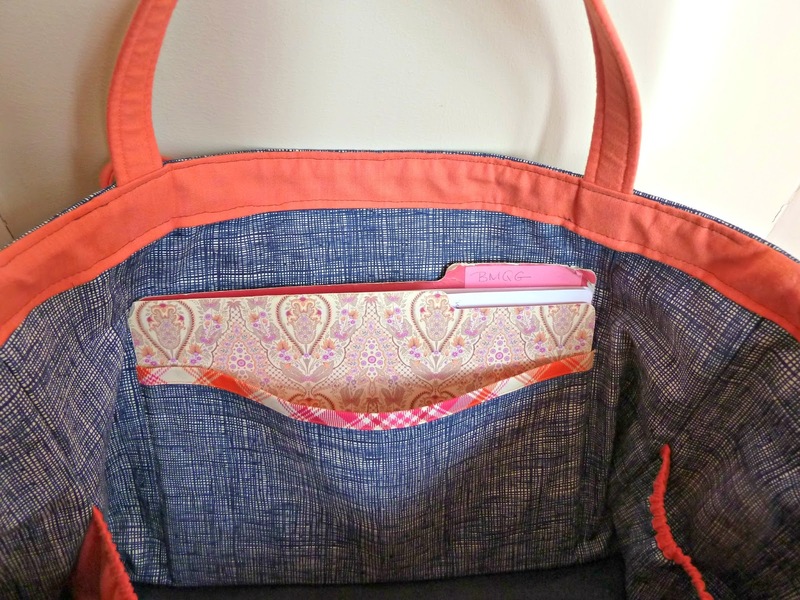 Try just using a double sided fusible to keep it in place or possibly handstitch the folded edge to the bag. 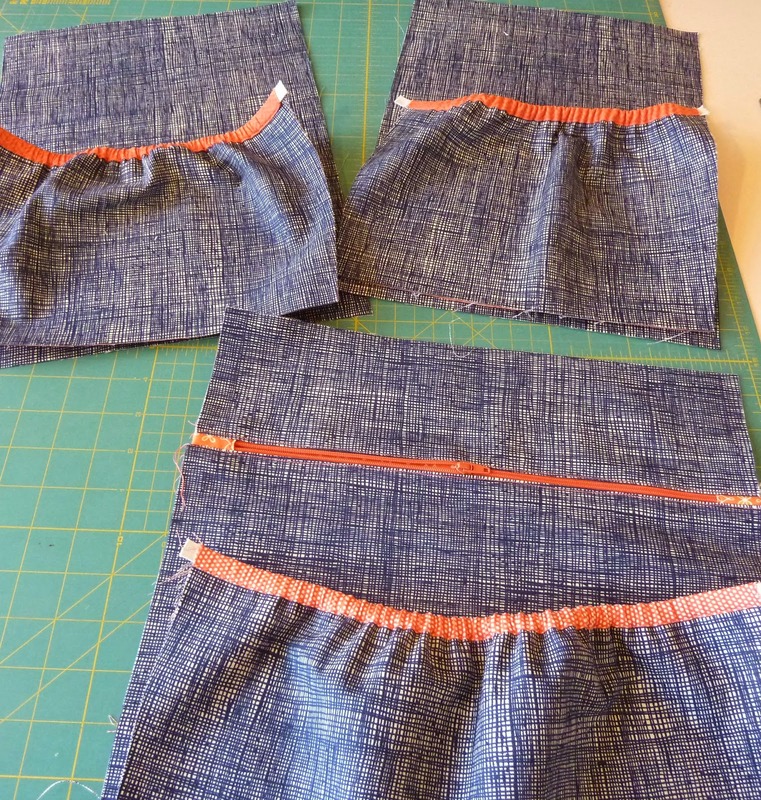 Still a lot of pockets, Simplify and lose a couple more of the interior pockets. I'd probably skip the short handles also. Also starting a new tradition with Sewjo Saturday at My Go-Go Life. I wish I had skipped a few pockets on mine. I ended up using the even feed quarter inch pressor foot when attaching the bottom and it worked great. I also pulled out an even feed stitch in the ditch foot. I have never used these feet but found they are great with bag making. Your bag looks great! As I was reading this, I was brought back to making the Weekender, which I still need to replace the zipper on - thanks for the reminder. Regardless, this tote looks awesome. I love your fabric choices and I can't wait to see it in person. Your bag looks great! And huge! It will be perfect for classes and retreats. But I think I will save my thumb and continue using my store-bought Vera Bradley bag. WOW! Amazing work! Your post is always fun to read. I hope your thumb is all healed now. I guess, this beautiful pain might make you forget all the pain you went through. I have this pattern, will use your tips when I make this one. By the way, your fabric choice for patchwork are just awesome. Telephone and penguin are my favorites. Wow, that looks intense! At least you have cute bandaids. And perfect fabric choices - you'll never get sick of looking at it! It turned out really nice Alice. I love the colors. Time to open the wine? Wow! You are so brave tackling these bags. I'm jealous. I'm sorry you hurt your finger though! Great job on the bag! If I had a twenty-eight page pattern I'd say "how pretty" and throw it into a pile of patterns never to be seen again LOL. The tote is really cute and I'm glad you stuck with it. Great job! 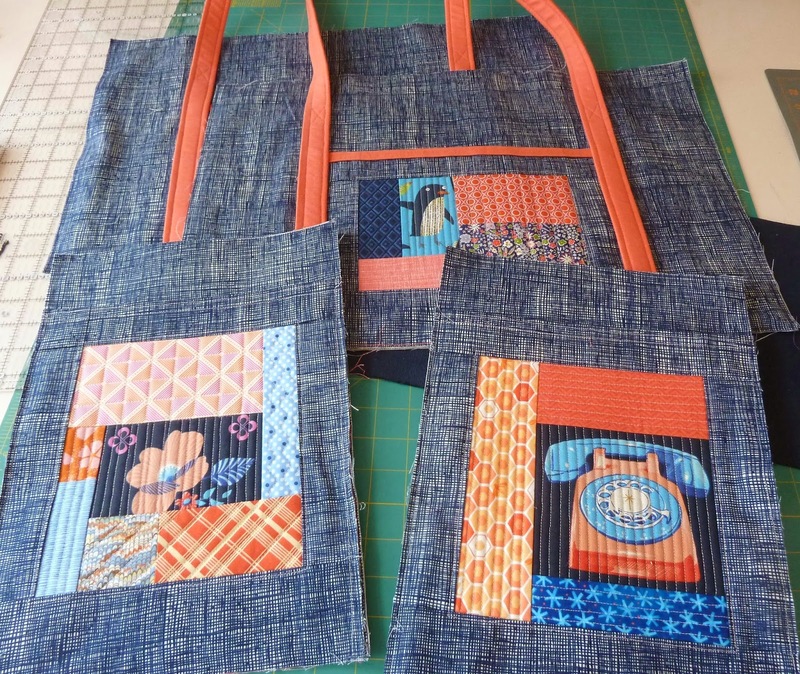 I am gong to bookmark your post as I am going to be starting a similar tote bag for my grand daughter. Briefly reading, it sounds like you have good instructions to help me out! Thanks for posting! I'll be back next week! Hopefully I can make mine as nice as yours! You did a fantastic job! Love all the colors, and pockets. Wow! The bag is beautiful and will be so useful. But I am SO impressed with your commitment to work through all those steps! Impressed! 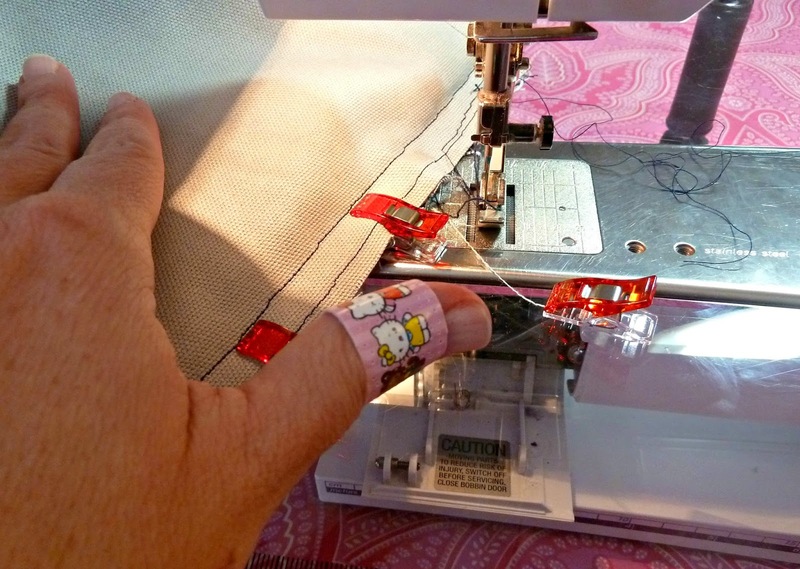 Aww..you sewed through your thumb...well as terrible as that is, at least the bag looks great, right? I think it does and was worth all that extra effort! What battle scars - but the bag came out gorgeous!! I'd love to attempt this pattern eventually so I'm taking notes from your tips :) Loving the peeking penguins! 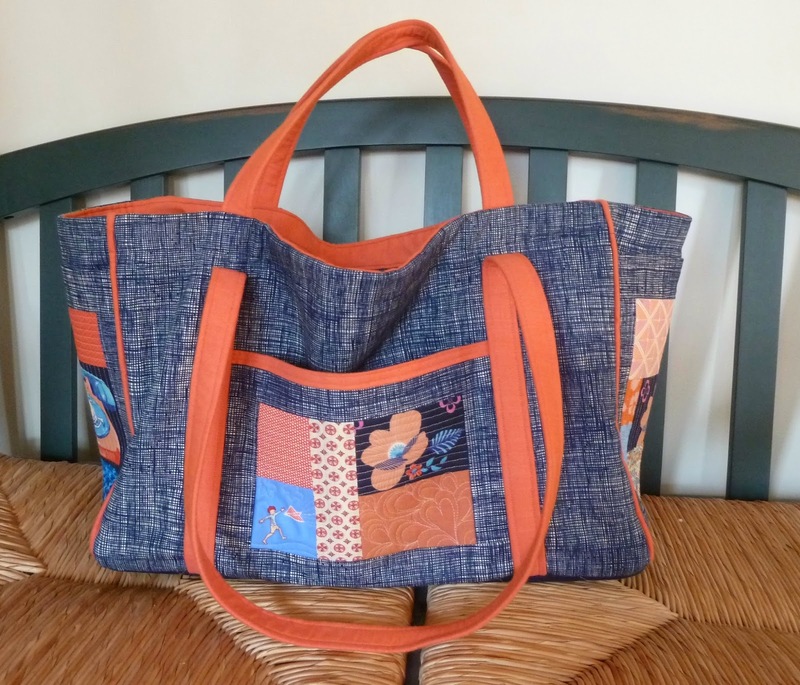 Holy cow, it's a beautiful tote but you just wrote how I would have probably experienced this myself that I now know I don't need this tote. lol (I'm pretty crappy at bags anyway so it was a long shot.) I am glad you have such a great tote as a reward for the effort, though. Getting ready to give this bag a go at the end of the month. Thanks for all your tips!